Are you tired of walking your dog in the rain? Looking for ways to give your dog a workout inside? Join RocketDog's Sarah Giammarino for Dog Gym Classes! Dolly practices the a-frame at St Helen's. In this 4 week course, you will learn how to give your dog a full body workout indoors using tricks, cool equipment, and how to fashion your own equipment at home. This class is full of tricks and information on training. It will help with body control and attention as well. It is ideal for anyone who has an energetic dog over 12 months of age and has completed a Basic Training class. It's very fun for older children to take their dog through this course. 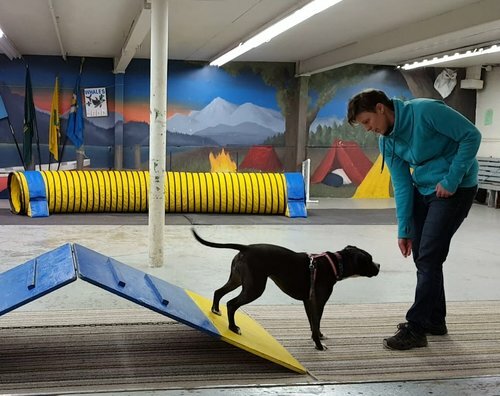 If you have a reactive dog that can't join the group class, consider auditing the program (half price) or using a "lesson dog" (one of Sarah's dogs!) to learn the techniques for your dog at home. Call or email today to sign up!